Amid growing electricity demand, volatile fuel costs and climate concerns, GE is focused on helping our customers meet their evolving renewable energy targets. We bring GE’s full offerings of world-class technology and service solutions to customers. 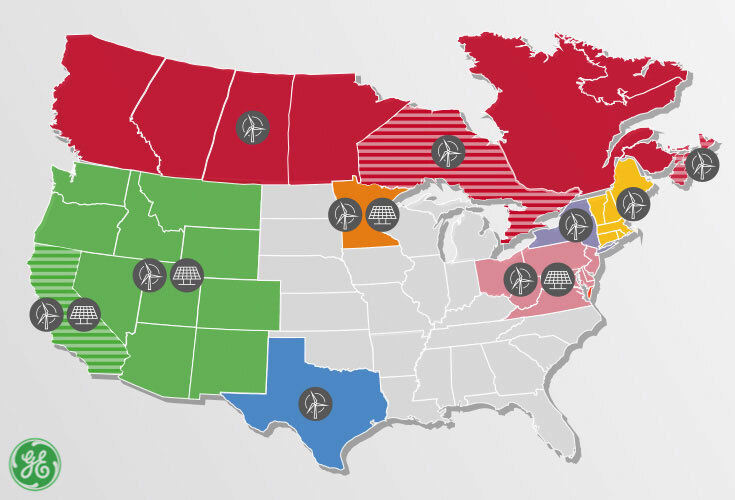 Often GE customers seeking renewables solutions start with integration studies from GE’s Energy Consulting group, like the ones highlighted on the map below, and in the case studies throughout this infographic. What happens to the grid when wind and solar plants increase in size and number? 3. The need for grid maneuverability, investment in flexible resources can be extremely valuable and allow the system to use more renewable generation. There is not a hard limit. Power grids can accommodate substantial levels of wind and solar power. Inventing the next generation of digital and industrial renewable technology and services to support grid integration and system support. Working with our customer IL&FS in India to develop an integrated renewables and storage plant. Partnering with industry thought-leading utilities and third party stakeholders to enhance state of the art renewables integration practices. Demand response as an active resource for wind and solar integration. Different types of renewables perform differently… better understand the difference between wind, utility scale PV and distributed PV. Need to better understand the impact of distributed generation on the bulk transmission system. Developing industry rules and system operations regulations that are designed to enable the incorporation of renewables into the modern grid along with traditional generation. Continue reading about the Hawaii Wind & Solar Integration study. Was this topic helpful to you? Give us a star rating on what you thought. Your thoughts are important to us. Learn more about a renewable integration GE is currently working on. To learn more about a renewable integration GE is currently working on, please complete the form below. Thank you for your inquiry. A representative should be in touch with you within 24 hours. View these additional resources to learn about the best practices for renewable integration. 1. WestConnect also includes utilities in California, but these were not included in WWSIS because California had already completed a renewable energy integration study for the state. "Hawaii RPS Study." Hawaii Natural Energy Institute. N.p., 19 May 2015. Web. 30 Mar. 2016. WESTERN WIND AND SOLAR INTEGRATION STUDY. N.p. : GE Energy, May 2010. PDF. PRIS Renewable Integration Study. Rep. General Electric International, Inc., Mar. 2014. Web. Digital images. GE Renewable Energy. N.p., n.d. Web.